Home Advantages. Hardware Advantages. MW Series. Lightning Pick’s rugged new MW Series delivers amplified performance, flexibility, durability and power efficiency to new or existing users of pick-to-light, put-to-light and other light-directed systems. Bold New Light Module Design. MW’s new, fully-enclosed bezel protects the light from debris. The enclosed design also eliminates the need for an additional face plate on the channel. Further, the black finish conceals normal dirt and wear typical of busy distribution centers. The dark bezel also accentuates the contrast between the enclosure and the illuminated quantity displays and domed light/confirm button, for optimized visibility. Higher Durability and Installation Efficiency. Easy to install and reconfigure to match changing pick faces, duct-channel-style MW Series modules snap into and out of heavy-duty, extruded aluminum open channels secured to existing rack or shelves. Thanks to its durable construction, the cable can be strung in a continuous path from shelf-to-shelf without connectors. This saves both time and cost in installation, as well as eliminates possible failure points. High-performance MW Series hardware provides a clear and advantageous hardware upgrade path for current Lightning Pick customers, including Pick-MAX (formerly IPTI) users. The MW family integrates with all other Lightning Pick light module hardware families — including the popular TW Series, which has been the industry standard for more than 10 years. Customers can select light modules from the hardware family whose unique features best match their specific application requirements. Existing customers can continue to expand their systems, adding new areas of lights from any of the different hardware families without having to replace their current hardware. 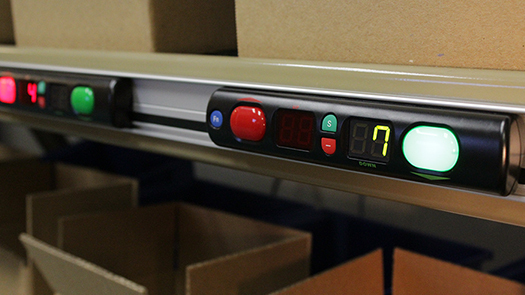 Open channel, easy mount and reconfigure design. Heavy-duty aluminum extruded duct for even better durability. Green construction with recyclable materials. Compatibility with existing Lightning Pick systems, including Pick-MAX, providing our customers with a unique hardware upgrade advantage. 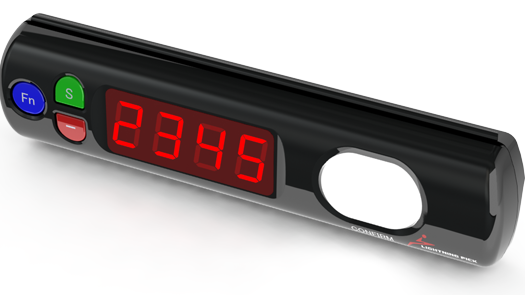 Available with no numeric display, or with a 4-digit quantity display. 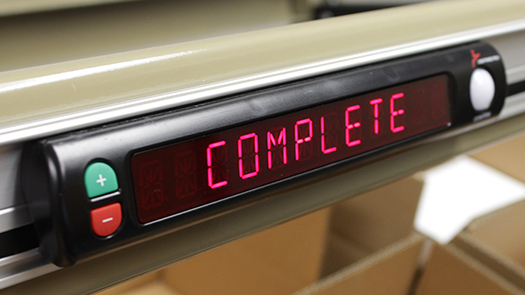 Domed LED indicator light/task confirmation button available in red, green, or seven-color LED option (white, red, green, blue, orange, purple and turquoise). 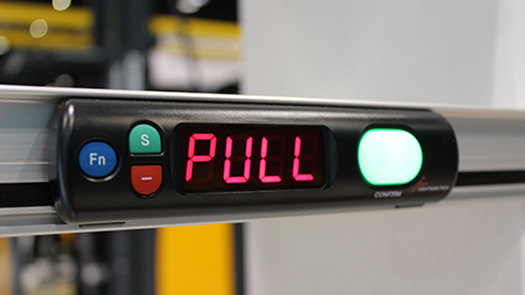 After 35 years of providing automated fulfillment systems and material handling technologies, Lightning Pick’s new MW Series light module family is the quintessential pick-to-light hardware. See it used in a classic zone picking, pick-and-pass application.